Monday, we take an easy (optional) tour to allow clients to acclimate. Those who want to participate, need merely to put their name on one of the tour lists kept at the front desk. Optional tour costs are added to your hotel bill and you can pay for them on check-out. Typical Optional tour for Monday: Iruitus Floating Islands We will take the hydrofoil to the floating islands of the Iruitus to visit the people who live on islands made from floating tortora reeds; then the small island of Piriti, where especially fine samples of pre-columbian pottery have been excavated. Those who do not opt to join the tour may sleep in and have breakfast whenever is convenient. The staff knows we like to sleep in and will fix eggs to order with fresh baked bread. Tonight, dinner is served early to allow guests to get out and observe early again. Typical Optional tour for Tuesday: This morning, those taking the optional tour will depart by bus early for Tiwanaku. We go by bus back to El Alto, the subburb of La Paz before turning north again to reach the ancient plateau of Tiwanaku. We visit the museum, filled with artifacts excavated from the site from Tiwanaku's III stages of development. Then, we explore the outdoor museum's pyramids, underground temple, courtyard and the puerta del sol. 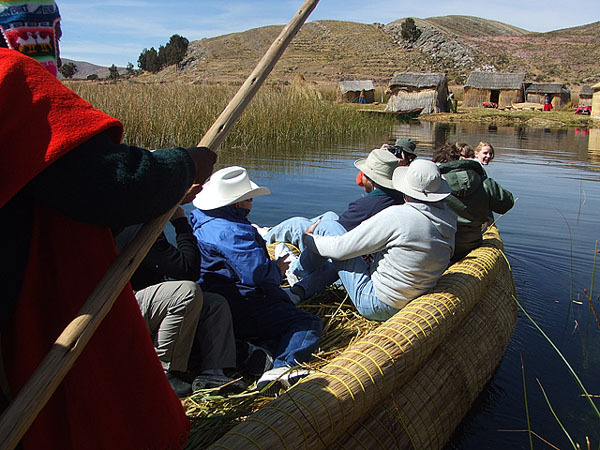 Activities at the hotel include the Altiplano Museum and the living cultural museum. Typical Optional tour for Wednesday: Another favorite option is the fossil hunt. Because this area of the Andes mountains was lifted by tektonic processes, there are many upturned hills which reveal layers dating back many thousands of years. In a favorite nearby hill, guests can visit one such hill where layers are actually tilted laterally. Visitors can walk laterally back through the eons, uncovering hidden treasures of fossils like trilobites and an ocassional fish trapped between layers of sandstone. Typical Optional tour for Thursday: Today, we will offer a more adventuresome optional program. A big favorite is the Chacaltaya Cosmic Ray Laboratory. We reach this high altitude observatory by bus, at an altitude of over 17,000 feet. The facility is uniquely situated atop the Chacaltaya glacier, where researchers can study cosmic radiation at high altitude. Years ago, when glaciers topped this area of the Andes, a ski resort operated on this mountain. This was once the highest place in the world to ski. Now, the glaciers are melted and guests visit the old coffee shop and enjoy breathtaking views out over the Andes, where distant mountains of Sajama can be seen in the distance. Some guests will wish to climb the path even farther up to see the old site of the abandoned observatory once operated atop this high peak. Fridays, we always offer an optional shopping trip to La Paz. Here, we get to wander the hilly, downtown streets of old La Paz. Columbian style buildings are the backdrop for a rainbow of color in local textile markets, music shops and even the witch-doctor's market. Here you can buy alpaca, woven awayo's, pick up a lucky tallisman, find jewelry of local silver and lapiz or malachite or even have your fortune told in molten pewter cast into water in the main square. Isla Del Sol Full day tour: This tour travels by hydrofoil to the epic island the incas called, "birthplace of the sun". Our group enjoys a lunch at the lovely restaurant overlooking Lake Titicaca before climbing the ancient incan steps to the sacred fountain of the island, where waters were proported to have magical healing powers. We also enjoy a visit to the colonial town of Copacabana. Water conditions pending, our group will stop at Isla de la Luna with its ruins of the Inca era. Full day program to Sorata and neighboring cave. This program travels by bus down the outskirts of the beautiful mountain Anchohuma. As we descend from the high plateau, we are treated to a fully panoramic view of both high, snow-capped mountain peaks of the towering 21,000 foot peak above the lowland valleys with tiny villages scattered in rivulets below. After passing through Sorata, we continue to a local cave, where the tektonic activity has left a large cavern with a mysterious black lake inside. Astronomical Tours is owned and operated by Serious Astronomers! and how best to assure the safe travel of your equipment to and from that location..